for the Surgery Dept., Endoscopy, Laboratory, Pharmacy, etc. O.R. tables, scrub sinks, etc. Nitril ESD Mat - for use in areas where static electricity is an issue. Disposable One Time Use, No Cleaning, No Mess! 4 major issues: Surgical comfort, fluid build-up, O.R. safety and fast room turn-over. team's feet dry and also reduce the risk of tracking bodily fluids throughout the surgical suite. Designed to Make Your Surgeons Smile! strenuous surgeries; mitigating foot, leg and back pain which can hamper productivity and focus. 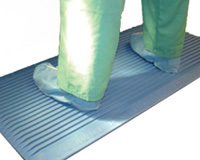 The innovative features of these 3/4" thick mats make them a necessity in every operating room. Cost Effective, Comfortable and Convenient! intense procedures, this mat is typically used together with a WaterBug® or other fluid suction device. Self-adhesive strips with a removable liner help to secure mat to surface. Available in two sizes: 20" wide x 39" long and 13" wide x 17" long. Tapered fluid channel design aids in keeping the surgical team's feet dry thus reducing the risk of slipping and falling on wet floors. The unique design also reduces the risk of tracking bodily fluids to other areas. Mats are disposable, non-slip molded foam, non-absorbant, latex free, anti-microbial and anti-static. Lightweight for easy removal. Shipped flat. Place onto clean, dry surface with adhesive strips. Made in the U.S.A. Note: Similar products sell for $680 per case of 10.
it's kind on the market! Prices quoted are FOB Factory. Freight is pre-paid and added to invoice. Prices are subject to change without notice. 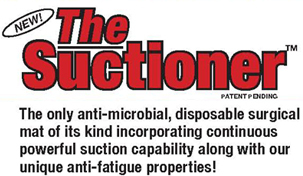 The Suction Mat™ incorporates a proprietary, highly-effective vacuum system which is a workhorse at suctioning all fluids coming down from the operative site onto the mat. Utilizing standard OR suction tubing in any length, The Suction Mat™ easily attaches to the operating room suction source in seconds. 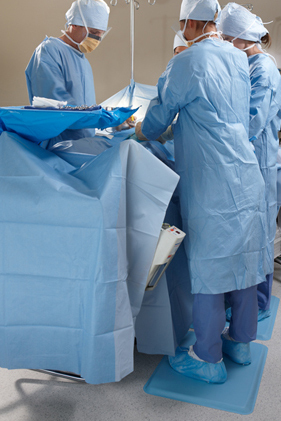 The Suction Mat™ has no limits and will ensure a drier, safer and cleaner surgical experience. Reduced need for laundry on the floor: It's a significant surgical cost which often goes unnoticed. 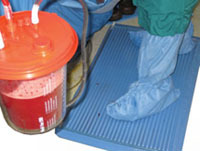 The use of countless blankets and towels placed on the OR floor to absorb fluids can be reduced or eliminated by using The Suction Mat™. This, in turn, makes for a much cleaner and safer work environment and can provide a substantial cost-savings. The anti-microbial properties of The Suction Mat™ can also aid in reducing the risk of OR infections and cross contamination. Shorter room turnover times: OR management is continuously searching for ways to reduce surgical turnover times and increase productivity and revenue. Less mess on the floor equals quicker clean-up times between surgeries. This translates into a greater number of surgical procedures performed in less time. 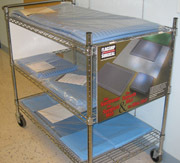 Convenient, space saving cart holds 10 large mats and 8 mini mats. Size: 10"w x 22"l x 42"h.
These reusable step stool mats are designed to help reduce leg and feet pain for surgeons and assistants during those long cases. They include both anti-fatigue and anti-slip properties. Underside of mat is designed with treads to help secure the mat to step stool surface*. 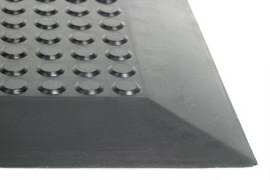 Flat top cones on the top of mat help to significantly reduce the risk of slipping*. 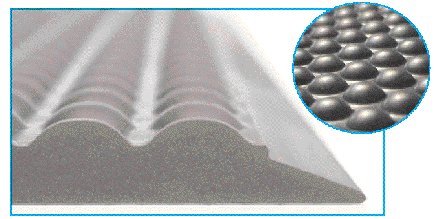 Channels between the cones and beveled edges on all sides allow for fluids to easily drain off the mats. 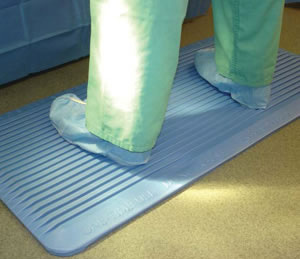 These uniquely designed flexible, pliable mats help to provide the necessary cushion for your surgeons and scrub nurses. Mats are latex-free mats. They are impervious to fluids and contaminates and are easily cleaned. Clean with diluted bleach or alcohol-based solution. Due to their small size, they can be easily cleaned, scrubbed and disinfected in a decontamination sink. Color coded feature allows you to color code mats according to the specific room or surgical section. Or you can color code based upon the floor or wall colors in your particular O.R. suite. Choose from 5 different colors. The 12¾" wide x 17½" long size is perfect for most surgical step stools including Phelan, Pedigo and Blickman. Custom sizes are also available. Contact us with your preferred size. 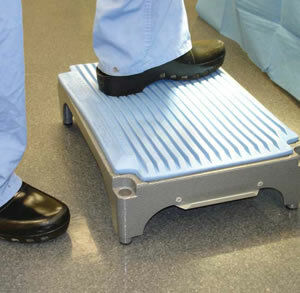 See listing of the most common surgical step stool sizes shown in the right column. *Note: Please use caution when steping onto or off step stool mat - as this is not a permanently attached mat. you purchase 10 or more at the same time, same or assorted colors: Just $69 each. Pedigo #P-1015 14" x 19". Phelan #5050-1: 13" x 17½". Blickman 8762-SS: 12" x 18". Clinton #SS-190: 12" x 18". Freight is pre-paid and added to invoice. Prices are subject to change without notice. *Improve circulation. 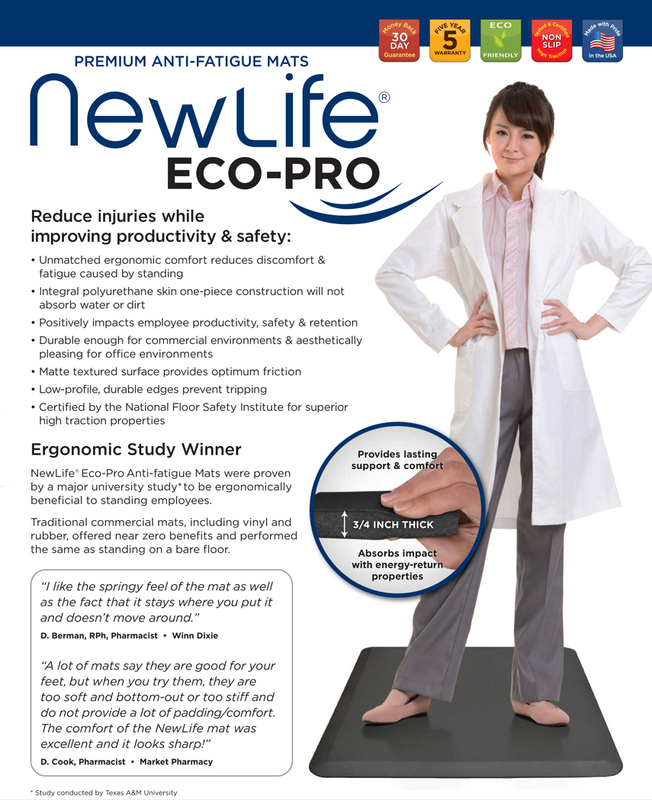 *Reduce discomfort and injuries. *Build a safer working environment. *Note: Please read complete descriptions below regarding use limitations. you can stand for hours in comfort and complete your tasks feeling refreshed rather than drained. caused from standing on hard flooring. 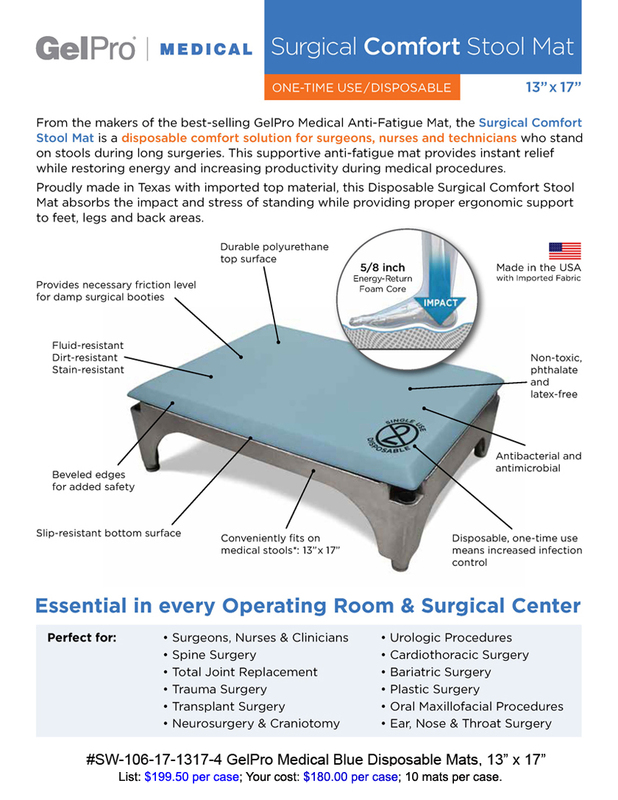 "The use of GelPro Mats improves surgeon comfort and ergonomics." Click here for study findings and excerpts. The Do Not Disturb Red mat lets hospital co-workers know at a glance that you are in the midst of an important project and should not be interrupted. Ideal for use in front of medicine dispensing stations and laboratories where the slightest interruption could prove detrimental to the health of your patient. GelPro® Anti-Fatigue Mats feature a ½" gel core, a ¼" foam layer and a superior traction bottom surface. 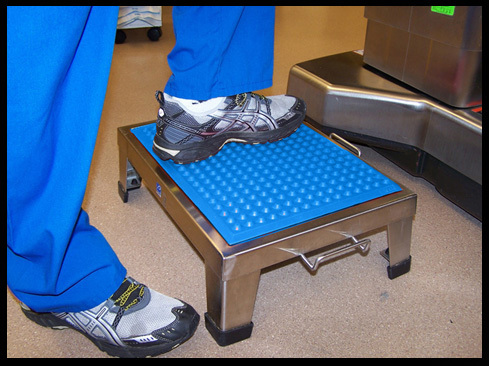 The top surface of this mat provides the necessary friction level to be compatible with damp surgical booties. where there is a lot of fluid on the floor. 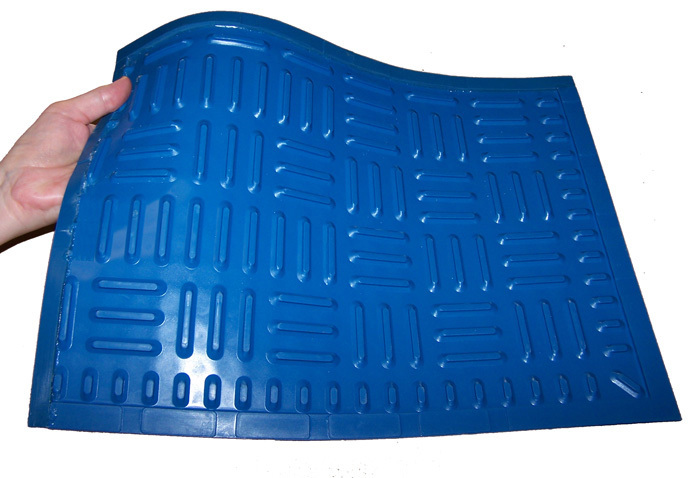 An Alternative: The Ergomat® Hygiene Reusable Anti-Slip Floor Mat (shown below) is often used in wet, slippery areas. 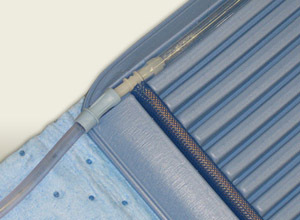 You may also consider the Suctioner™ disposable fluid suction mat shown above for very wet areas. anti-bacterial properties and they are CAL117 compliant and NFPA 260 certified. this mat the wrong way may void the warranty. and usage instructions and cautions. 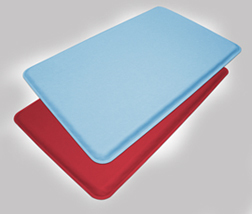 GelPro® Anti-Fatigue Mats are available in 3 different sizes and 3 different colors. 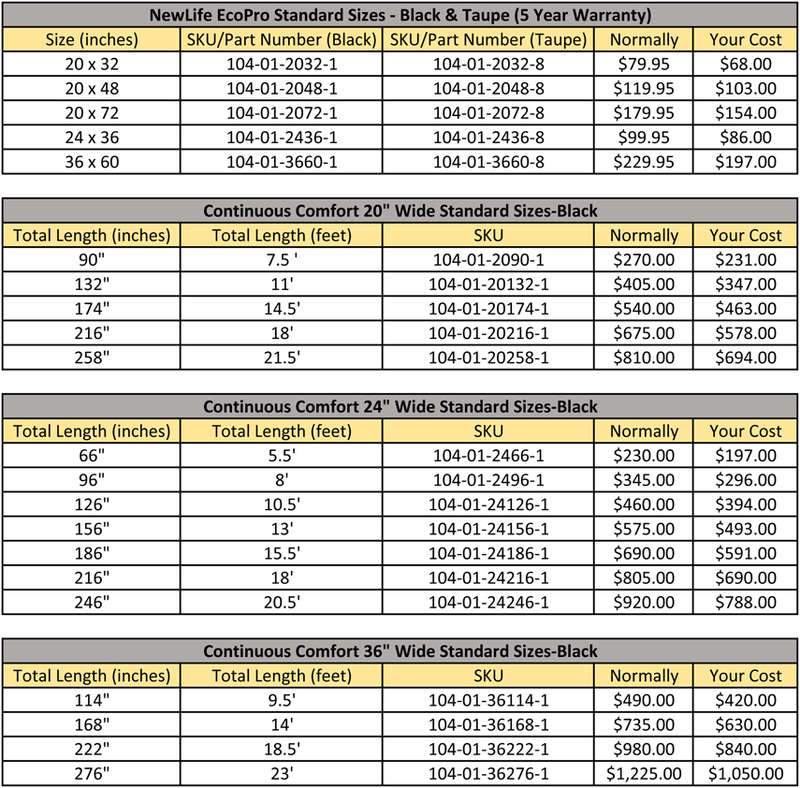 Size choices: 18" wide x 24" long; 20" wide x 32" long and 20" wide x 48" long. Columbia Blue is a light Blue commonly found in operating rooms, on surgical drapes and as the predominant color for medical scrubs. The color is easily recognizable as it provides a contrast to flooring often found in the operating room. Surgical Green is a yellowish-green reminiscent of the color of a ripe pear. It matches the color of scrubs commonly found in operating rooms and is designed to be easily visible on white or grey operating room floors. DND Red is a bright, vibrant red. Designed for for use in "no interruption zones", the Do Not Disturb Red mats lets hospital co-workers know at a glance that you are in the midst of a project that requires intense concentration. 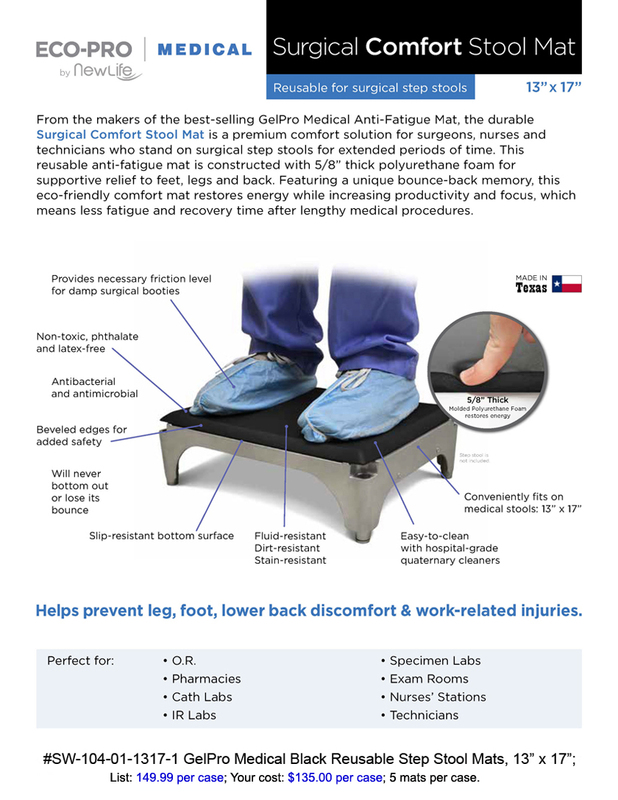 GelPro® Anti-Fatigue Mats are used in operating rooms, radiology, cardiac cath lab, medication dispensing stations, lab testing areas, pharmacy and other areas where extended periods of standing are required. 3 or more cases are purchased. and logo onto these mats. will apply. Call for details. It's easy to clean and impervious to fluids and contaminates. And it has good anti-fatigue and some anti-slip properties. Actual thickness 7/16" from top to bottom. Raised circles are just 1/16" high allowing for easier cleaning. Includes beveled edges on all sides unless specified otherwise. Nitril Smooth is the smooth version of the Ergomat Nitril Anti-Slip Mat shown below. This mat helps to solve the problem of short term fatigue. It reduces the risk of long term injury associated with standing work positions. Above cut-away photo of mat show hollowed out square grid design. The square grids and 1/16" high raised circles provide shock absorbency and some anti-slip properties. It also includes beveled, low profile edges on all sides for safety. Since it is designed not to curl up, it eliminates concerns about tripping. Made with Latex-free, 100% virgin nitril rubber, it withstands all types of cleaning including chemical, steam and high pressure cleaning. The 23½" x 35¼" size is autoclavable at 250° - but it must be laid out flat when cooling. The Nitril Smooth is recommended for Clean Room 100/ Class 3 Environments. 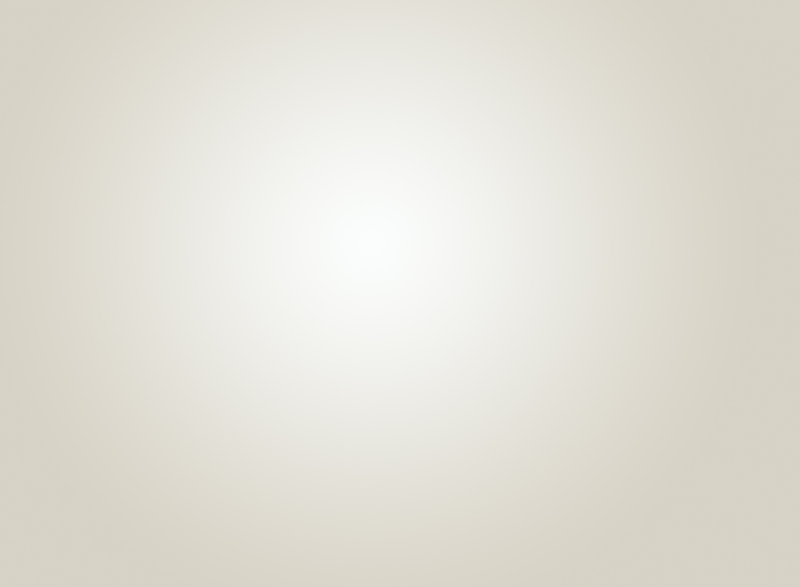 It is also used in areas subject to daily wash down and dry, damp or humid areas. 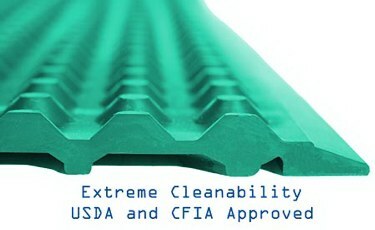 This mats performs well in hot areas and cold environments of <5°C/ 40°F. Typical users are found in the healhcare and pharmaceutical industries. This particular mat is especially appropriate for Infusion areas and for certain applications in the Surgery Department. Can this mat be used in the O.R. and G.I. Lab? Unlike polyurethane and blown foam mats that really are more comfortable, this mat is a better choice because it is impervious to fluids and contaminates. It's also a better choice because it's easily cleaned with either a string mop, chemicals, steam or high pressure hose. The concern however has to do with potential exposure to "excessive fluids." 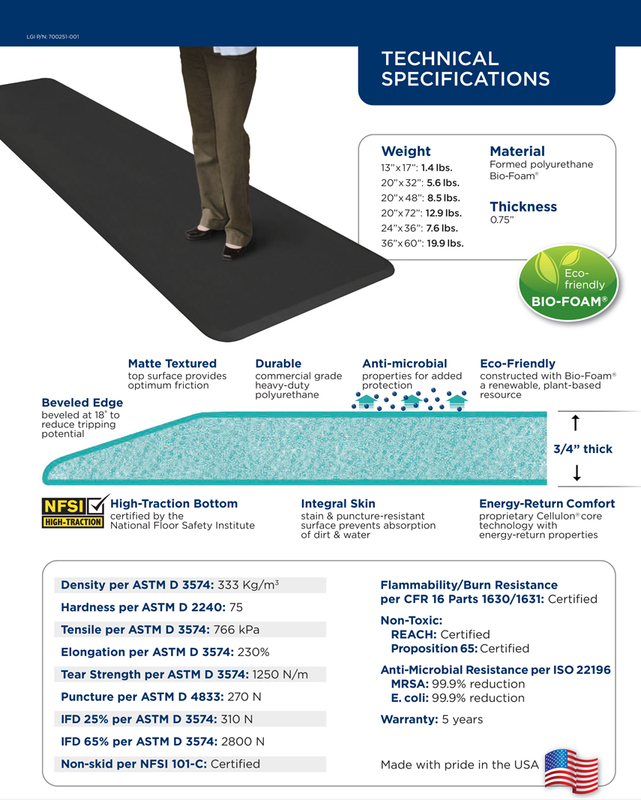 Since this is basically a smooth mat, it cannot be truly classified as an "anti-slip mat" like the Endurance®, Hygiene or Nitril Mats shown below. 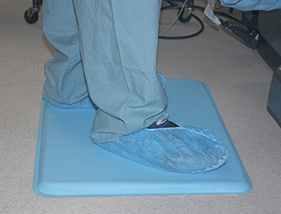 Although there is a risk of slipping and injury if there are excessive fluids spilled around the mat, more surgeons are insisting on using this type of comfortable "anti-fatigue mat" - for use next to their O.R. tables during those long cases. O.R. Directors also prefer this mat because it is easier to clean than anti-slip mats. The customer must determine if an excessive amount of fluid may necessitate the use of an anti-slip mat instead of an anti-fatigue mat. Ultimately the suitability of the product for the application in all aspects must be determined by the buyer. Three year warranty: This mat will not lose its elasticity and will provide continuous ergonomic benefits. 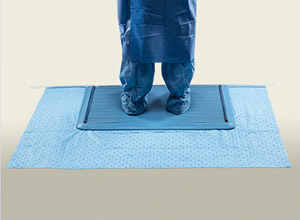 Tip: These mats are placed next to the Surgery Table to reduce fatigue. But they must be cleaned between cases. To reduce room turnover time, buy additional mats and clean them as time permits or at the end of the day. Also avail. in 4', 5' and 6' widths. Prices quoted are FOB Factory. Freight is pre-paid & added to invoice. 3 or more are available. Nitril Smooth Mats include beveled edges on all sides. They are 7/16" thick and are black. Available in 2', 3' and 4', 5' and 6' widths and various lengths from approx. 3' to 60'. Custom sizes and shapes are also available. Actual thickness is 7/16". Includes beveled edges on all sides. Available in Gray/ Blue only. Not recommended for Surgery Dept. use. ERGOMAT® Basic Smooth Anti-Fatigue Mats are designed to provide ergonomic support in combined rolling and standing environments. They deliver almost identical ergonomic stimulation and comfort as the Complete Smooth Polyurethane Mats and cost less. Warranty is 2 years instead of 3 or 5 years . This mat is fire retardant. It has moderate chemical resistance and is cleanroom certified. But it is not impervious to contaminates or disinfectant chemicals. Includes static control properties. Color is Gray/ Blue. 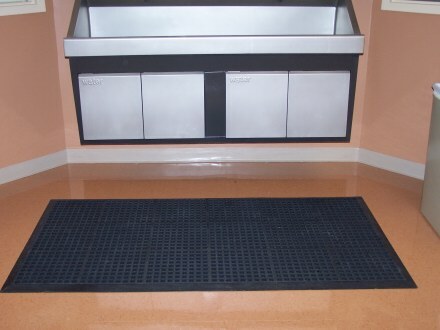 *This Basic Smooth polyurethane flat mat has identical properties to the Complete Bubble and is specifically designed for combined standing and rolling environments like nurses stations, pharmacies, mailrooms and distribution centers. It is also a great mat for large areas, walkways, etc. Recommended for Clean Room 100/ Class 3 and Dry environments. Latex-free. It is not intended for use as a chair mat. Also it is not recommended for use on slick waxed tile floors since it could move. Although we do offer a thin but rough self adhesive neoprene material that, when placed under the mat, significantly reduces the risk of any mat movement. This optional neoprene sheet is available at a nominal cost. Basic Smooth Mats include beveled edges on all sides. They are 7/16" thick and are gray/ blue. Available in 2', 3' and 4', 5' and 6' widths and lengths from 3' to 60'. (in 1' increments) Custom sizes and shapes are also available. Includes 2 year warranty. It will not lose its elasticity and will provide continuous ergonomic benefits. Quantity discounts for 3 or more are available. 3 or more are available. Also avail. in 4', 5' & 6' widths. Prices quoted are FOB Factory. Freight is pre-paid & added to invoice. Prices subject to change without notice. Terms & conditions. This Anti-Fatigue Mat provides maximum comfort! Actual thickness is 5/8" from top of cones to bottom of mat. Includes beveled edges on all sides. The ERGOMAT® Classic Standard Bubble Anti-Fatigue Mat is a very comfortable mat used in all dry, non-abrasive areas. The beveled edges on all sides will never curl up, eliminating tripping hazards. Highest Quality: Made with virgin raw material only, this mat provides unbeaten durability and lifetime ergonomic benefits. The Classic Standard is a solid mat throughout with no hollow bubbles that collapse. This design provides a long term solution to keep the "bounce back" effect throughout the unmatched 8 year warranty period. This premium grade polyurethane bubble mat is the ultimate ergonomic matting choice for any dry, non-abrasive environments. But it is not impervious to contaminates or disinfectant chemicals. The Classic is however cleanroom certified and anti-static. Thus, this an ideal mat for static control areas, electronics manufacturing, assembly lines, warehousing and distribution. *Possible hospital usage areas include: O.R., C.S., E.R., Laboratory, Pharmacy, Engineering, Receiving, Radiology and other areas. This solid polyurethane anti-fatigue mat is generally considered to be more durable and long lasting than rubber mats with blown foam. And it won't compress after just 6 months. It's also easy to clean! This mat helps to solve the problem of short term fatigue. Also reduces the risk of long term injury associated with standing work positions. Note: This mat is more comfortable than the Nitril mat shown above. But it's not as slip-resistant. Nor is it as impervious to contaminants or disinfectant chemicals as the Nitril mat. This mat is not recommended for use on slick waxed tile floors since it could move. Although we do offer a thin but rough self adhesive neoprene material that, when placed under the mat, significantly reduces the risk of any mat movement. This optional neoprene sheet is available at a nominal cost. Available in 2', 3', 4', 5' and 6' widths and lengths from 3' to 60'. (in 1' increments) Custom sizes and shapes are also available. Sweep or vacuum as appropriate. Also may be hosed or cleaned with a string mop if necessary. It will not lose its elasticity and will provide continuous ergonomic benefits. Latex-free. Also available in 5' & 6' widths. Prices quoted are FOB Factory. Freight is pre-paid and added to invoice. For moderately damp and/ or oily environments. ERGOMAT® Complete Bubble Anti-Fatigue Mat looks like the Ergomat Classic. It is engineered for moderately damp and/ or oily environments and areas where static control and fire retardancy is a concern. But it is not impervious to contaminates or disinfectant chemicals. *It is ideal for the automotive, electronics and printing industries. Warranty: 3 years. It features moderate chemical resistance, static control and it's fire retardant. These very comfortable polurethane mats are black, 5/8" thick. Available in 2', 3', 4', 5' and 6' widths and lengths from 3' to 60'. (in 1' increments) Custom sizes and shapes are also available. Latex-free. Dry, Oily, Static Control/ ESD. This mat helps to solve the problem of short term fatigue. It also reduces the risk of long term injury associated with standing work positions. Note: This mat is more comfortable than the Nitril Mat shown above. But it's not as slip resistant. Nor is it as impervious to contaminates or disinfectant chemicals as the Nitril Mat. This mat is not recommended for use on slick waxed tile floors since it could move. Although we do offer a thin but rough adhesive neoprene material that, when placed under the mat, significantly reduces the risk of any mat movement. This optional neoprene sheet is available at a nominal cost. Also available in 4', 5' and 6' widths. Designed for standing and rolling environments. Not recommended for use in the Surgery Area. ERGOMAT® Complete Smooth Anti-Fatigue Mat is designed to provide ergonomic support in combined rolling and standing environments. This mat is fire retardant. It has moderate chemical resistance and is cleanroom certified. But it is not impervious to contaminates or disinfectant chemicals. It does include static control properties. 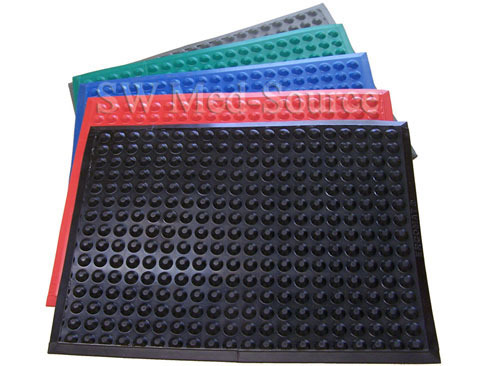 *This polyurethane flat mat has identical properties to the Complete Bubble and is specifically designed for combined standing and rolling environments like nurses stations, pharmacies, mailrooms and distribution centers. It is also a great mat for large areas, walkways, etc. Above cut-away photo of mat show hollowed out square grid design. The square grids and 1/16" high raised circles provide shock absorbency and some anti-slip properties. Recommended for Clean Room 100/ Class 3 and Dry environments. Latex-free. Complete Smooth Mats include beveled edges on all sides. They are 7/16" thick and are gray. Available in 2', 3' and 4', 5' and 6' widths and lengths from 3' to 60'. (in 1' increments) Custom sizes and shapes are also available. Includes 5 year warranty. It will not lose its elasticity and will provide continuous ergonomic benefits. Quantity discounts for 3 or more are available. for safety and comfort in wet environments. #1 Best Performing Anti-Slip Mat for wet areas. Ideal for Surgery Dept., Food Service Dept, etc. 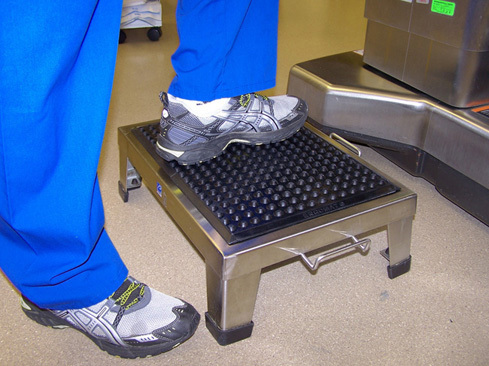 Our #1 Best Performing Anti-Slip Mat for O.R. Scrub Sinks. Above 1 piece bonded mat measures 3' 4" wide x 6' 4" long incl. ramps. ERGOMAT ENDURANCE® is a pure 100% Nitril rubber drainage mat designed for safety and comfort in wet environments. It's not just an ordinary rubber drainage mat. It's a very durable, non-porous mat which means it's impervious to contaminants and disinfectant chemicals. And it won't harbor bacteria. The multi-layer design (see below photo) provides structural integrity, anti-fatigue comfort and an exceptional anti-slip surface. Moulded beveled edges won't curl up, thus eliminating tripping hazards. And the mat has channels underneath to allow for water to drain properly. Plus it has a 5 year warranty! Actual thickness is 5/8" from top to bottom. Although the standard size is 3' x 4', these mats are available in nearly any size or shape. Ramps are 2" wide. Thus, including the ramps on all 4 sides, the mats are actually 4" wider than the stated surface area. Sizes larger than 3' x 4' can either be bonded together (as shown in scrub sink photo above) or joined together with durable, non-obtrusive clips. There is no upcharge for any length mat in 2', 3', 4', 5' or 6' widths as long as the mats are done in 1' increments. Other special bonded sizes are available at a 15% upcharge. Joining clips (#M60-1) for endurance mats are $2 ea. Two or three clips are typically used to join 2 sections together. Mats cannot be rolled or bent when joined together with clips. Please contact us for clarification or a price quote. Note: The Endurance Mats are heavier and not as easily moved for cleaning as the Nitril and Hygene Mats shown below. But they're also much less likely to move in very wet environments. A 2' x 3' Endurance Mat weighs approximately 17 lbs. A 3' x 4' size weighs approximately 34 lbs. *Primary hospital usage areas include the Surgery Department. Specifically, they are ideal for use in your SPD/ Clean Room, Central Reprocessing/ Decontamination Area, Treatment Room and especially in front of your scrub sinks. These mats are also used in Central Supply, Lab, Endoscopy, Dietary Services and other wet areas. They are also often used in commercial kitchens and pharmaceutical manufacturing. Latex-free. Warranty: Five years against breakdown due to oil or grease contact. Including the ramps, mats are actually 4" wider than the stated surface area. Joining clips (#M60-1) for endurance mats are $2 ea. 2 or 3 clips are typically used to join 2 sections together. Chemical Resistance: Good to excellent for oil, gasoline, animal and vegetable oils, alkalies and aliphatic hydrocarbons. Steam clean with high pressure power hose, hose down or mop as appropriate. ERGOMAT® HYGIENE MAT - IN COLORS! Choose from 4 colors: Green, Grey, Blue or Red. Actual thickness is 7/16" from top of cones to bottom of mat. *Primary hospital usage areas include surgery departments, laboratories, food processing facilities and commercial kitchens. Available in Green, Gray and soon Blue and Red. Warranty: 3 years. ERGOMAT Hygiene Anti-Slip/ Anti-Fatigue cone profile mat is designed for areas where cleanability and daily sanitation are crucial. It resists repetitive chemical washes and retains its ergonomic properties throughout the warranty period. Like the Black Nitril Mat shown below, it is non-porous and impervious to fluids and contaminates. Also, like the Black Nitril Mat, the 2' x 3' size is autoclavable at 250° - but it must be laid out flat when cooling. The advantage it offers over the Black Nitril Mat is it's available in different colors! The Hygiene Mat is made with premium rubber and is designed to increase comfort while reducing tripping hazards, body aches, etc. This is the best mat for high cleanability. Customers also tell us it's more comfortable than the Black Nitril Mat. So for areas like next to an O.R. table, this may be the perfect mat since it is has both anti-fatigue and anti-slip properties and is impervious to fluids and contaminates. *However smaller sizes in particular are not recommended for use on very slick waxed tile floors since they could move if the floor becomes very wet. Note: We do offer a thin but rough self adhesive neoprene material that, when placed under the mat, significantly reduces the risk of any mat movement. This optional neoprene sheet is available at a nominal cost. Delivering the same longstanding ergonomic benefits as the Nitril mat, the new ERGOMAT Hygiene expands the performance scope of the Ergomat line. It is a non-porous mat. It is exceptionally resistant to alcohol, oxygenated and chlorinated compounds and other caustic sterilization products. Recommended for the following environments: Clean Room 100/ Class 3, Daily Wash Down, Damp/ Humid, Dry and Wet*. *Note: Frequent washes will not affect the state of the mat; no curling up, no swelling, no expanding and no loss of ergonomic properties. Latex-free. Note: Be careful of fraying or otherwise damaged electrical cords. Cords should not be run over with heavy equipment. Available in 2', 3' and 4', 5' and 6' widths and lengths from 3' to 60'. (in 1' increments) Custom sizes and shapes are also available. Includes beveled edges on all sides. Available in Black or Gray. A 2' x 3' Nitril Mat weighs only 8 lbs. so it can be moved easily for cleaning. 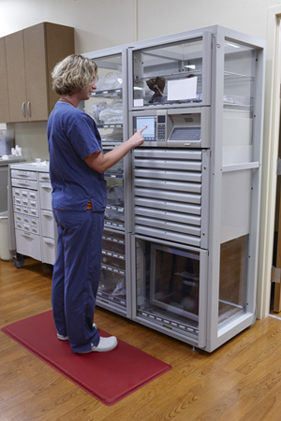 *Primary hospital usage areas include the Surgery Department (next to the scrub sink or O.R. table), Central Supply, Lab, Endoscopy, Dietary Services and other wet areas. It's also used in commercial kitchens and pharmaceutical manufacturing. ERGOMAT® NITRIL Anti-Slip/ Anti-Fatigue cone profile mat is used where a high degree of cleanability and slip resistance is important. It is non-porous and impervious to fluids and contaminates. The 2' x 3' size is autoclavable at 250° - but it must be laid out flat when cooling. This mat helps to solve the problem of short term fatigue but it is primarily an anti-slip mat. This mat can reduce the risk of long term injury associated with standing work positions. Includes beveled, low profile edges on all sides. Flat-top cones provide extra shoe contact and foot stability. 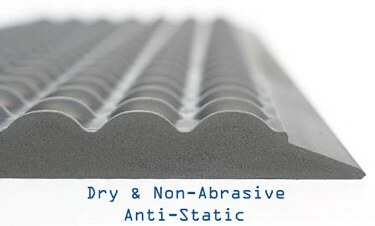 Ridges under mat provide extra slip resistance in all directions. *However smaller sizes in particular are not recommended for use on very slick waxed tile floors since they could move if the floor becomes very wet. Note: We do offer a thin but rough self adhesive neoprene material that, when placed under the mat, significantly reduces the risk of any mat movement. This neoprene sheet is available at a nominal cost. Latex-free, 100% virgin nitril rubber withstands all types of cleaning including chemical, steam and high pressure cleaning. It's also non-porous so it won't trap bacteria! 2' x 3' size is autoclavable at 250° - but it must be laid out flat when cooling. 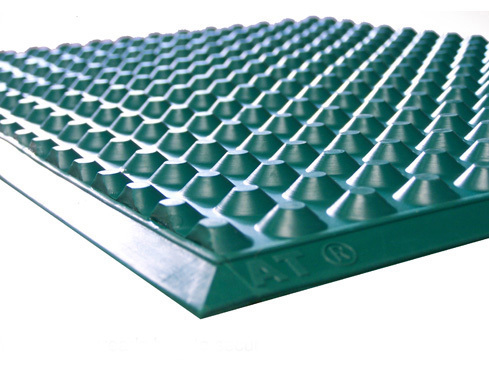 This pure Nitril rubber cone mat is also designed for areas exposed to oil and petrol based products (coolant, etc.) as well as chemicals. Also commonly used in metal fabricating, sealant and paint departments. As the mat retains its ergonomic elasticity down to –40ºC, it is also a great solution for cold storage and food production. Latex-free. Includes 3 year warranty. It will not lose its elasticity and will provide continuous ergonomic benefits. 4' widths also available. Call for price quote. Custom sizes and shapes also available. Available in 2', 3' and 4', 5' and 6' widths and lengths from 3' to 60'. (in 1' increments) Note: This is not a static contol mat. See Nitil ESD product shown below. 3 ore more are available. Also available in 4' width. ESD Mat weighs only 8 lbs. so it can be moved easily for cleaning. *Possible hospital usage areas include Surgery and Bio-Medical Engineering. Other users include electronics, microprocessor manufacturing, etc. ERGOMAT® NITRIL ESD is the perfect anti-fatigue solution when conductive properties are required to discharge static electricity. Features very good anti-slip properties. *However smaller sizes in particular are not recommended for use on very slick waxed tile floors since they could move if the floor becomes very wet. Note: We do offer a thin but rough self adhesive neoprene material that, when placed under the mat, significantly reduces the risk of any mat movement. This neoprene sheet is available at a nominal cost. It withstands all types of cleaning including chemical, steam and high pressure cleaning. Autoclavable at 250° -must be laid out flat when cooling. These mats are 7/16" thick and are black. Available in 2', 3' and 4' widths and lengths from 3' to 60'. Custom sizes and shapes also available. Beveled edges included. Latex-free. 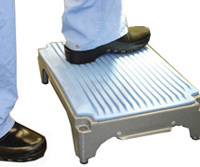 Ergomats improve circulation... so you can stand longer and more comfortably. 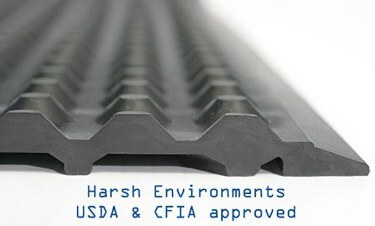 Ergomats are a unique line of anti-fatigue mats with outstanding ergonomic benefits, suitable in the most demanding environments. and injuries to feet, legs and lower back. 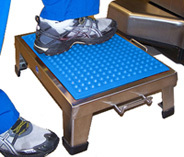 These mats help prevent discomfort and health issues related to working in a standing position. For more information on ERGOMAT®, please see their website @ www.ERGOMAT.com. *Please note that while the right mat can reduce the risk of slips and falls, no product can guarantee that accidents won't happen. on this website page accept no responsibility for mis-use or damages involving the use of these products. Regarding Warranty: All ergomats are conditionally warranted against normal usage* 24 hours a day, 7 days a week. portable x-ray machines, C-Arms, O.R. tables, skids or pallets. Warranty period starts from the date of purchase. subject to a manufacturers 15% restocking fee unless it was for a no charge trial or ordering error on our part. 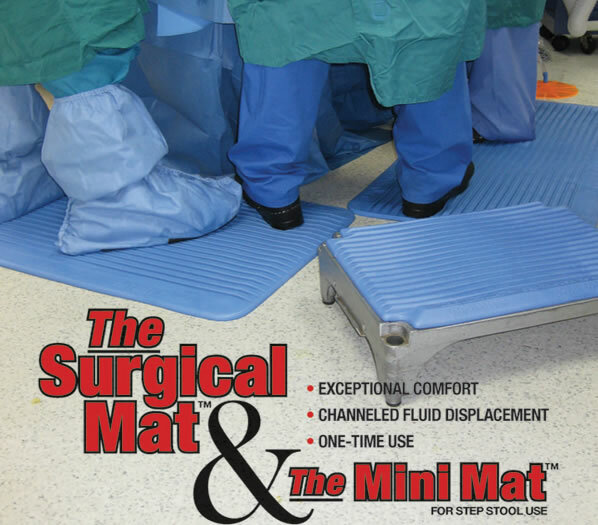 The Surgical Mat™, The Mini Mat™, The Suctioner™ or GelPro® Floor Mats. Page updated 1/18; Copyright 2005 - 2018, SW Med-Source Inc., All Rights Reserved.